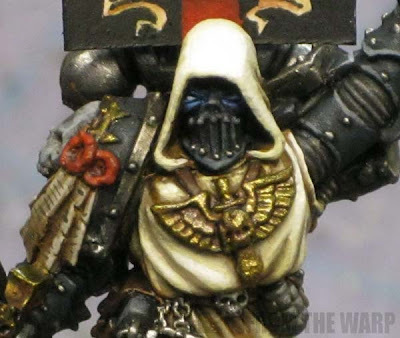 When I posted my Asmodai Interrogator Chaplain model the other week, I thought I should go into layering a bit more since I used it on his robes and I got a few emails asking about the whole process afterwards. Layering is one of those things that I think has it's place just like the rest of the techniques out there. Use in the right place and you'll be all set, use it at the wrong time and you'll create nothing but problems and work for yourself. To me, it's the process by which you add layer after layer of slightly thinned paint (so as not to obscure the surface detail) on an object on a model in order to move from light to dark (or the other direction) gradually over the surface. 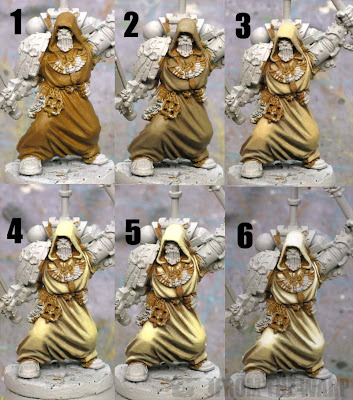 For example, on robes where you'd want to transition between the lighter, raised folds and the darker, recessed portions. Basically it gets you from one shade to another in a smooth transition that you can control. Washes do something similar, but you cannot control the gradation of colors as well as you can when layering. This allows you to put the focus where you want and not just where the wash falls. So when do you do it? Most of the time, I use it to go from dark to light. In those cases, I'll start with the darkest color and work up to the lightest color on the upper most edges. I don't work the other way (light to dark) since that would mean I'd end up trying to add my darker colors in between my light ones and trying to work into the recessed areas. What a pain. I try and figure out what I want my darkest color to be along with my lightest color as well before starting. Most often, my lightest color is close to white and my darkest is the "shadow" color for the area I'm working in. Then it's a matter of figuring out how many steps or shades I want between those two end colors. The more steps I decide to add, the longer it takes and the better it looks most of the time. Now, that being said, you don't have to do a thousand layers to get a good effect either. 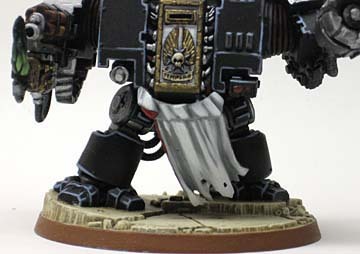 The photo of the Dreadnought tabard below has only two layers. The grey shadow and the white highlight on top of it. It just goes to show that you don't need a hundred layers to get a quick and effective transition either. There is a balance between time, work involved and the effect you're shooting for. If it's just a quick blend for a "tabletop" paintjob, then you shouldn't have to do 40 layers when 3 or 4 will do the trick just fine. With this guy, I did six steps to get from the shadow of GW Calthan Brown up to a layer of thinned white on the uppermost points. I was able to control where wanted my highlights (the white) because I was layering and didn't just apply a wash over the whole thing. 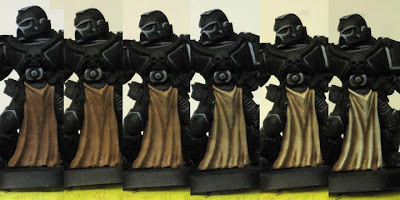 You can do that though... use a wash over the whole thing to get a similar effect if you're not comfortable thinning your paints and working over the same area over and over. This post here on shading cloth will show you that process. So how do you actually "layer" then? It's similar to painting as you would normally. I say normally if you already thin your paints slightly as you put them on your model. 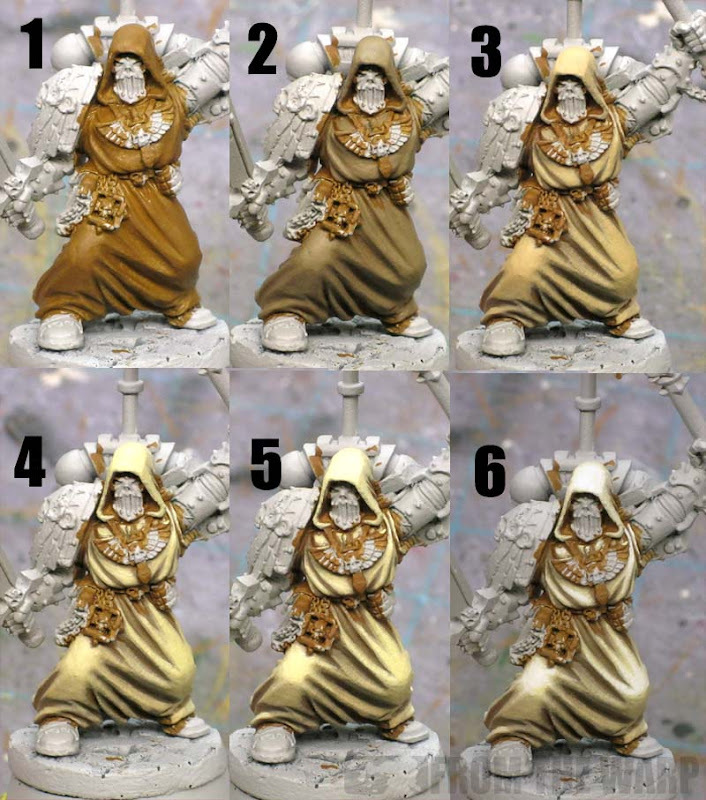 If you're not one of those folks who thins, then you'll need to practicing "thinning" or getting your paint to the consistency of milk before you apply it to your model. That's the best way I know how to explain it. You want it a bit runny and somewhat transparent. If I were to try and describe it in terms of a ratio of paint to water, I'd say 1:1. That's about what I go for. Going a bit heavy on the paint will make your layer more pronounced where as leaning towards a bit more water will have the opposite effect. It's not an exact science. If you add too much water, you'll just end up needing to make another pass to get the color down. The idea is to paint the whole area with your shadow color and then keep adding layers of lighter and lighter colors up to your highlight... BUT leaving a tiny bit of the previous color showing in the recessed areas as you work towards your highlighted area. Going back to Asmodai, he starts out as the shadow color overall. The first color (#2) goes on there and I leave some of the shadow color showing in only the deepest folds of his robes. The same thing applies to #3. Most of the previous color is covered up except for where I want it to show through around the recessed area. 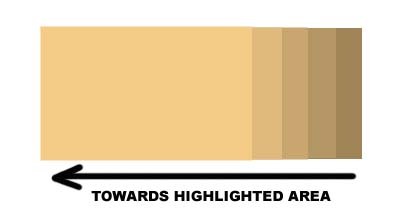 Each pass works outward from the shadow areas and towards the highlights. The closer I get to my highlight color, the less and less surface area I'm actually covering. Steps #5 and #6 show this best. There is only a tiny area covered in both of those. Here's another look at another tabard on a model. You can see the breaks between each layer as I worked up to light tan as my highlight color. This is why it's so important to thin your paints. By the time you get to the final layer, you're looking at six coats of paint on the model not including primer. The two hardest things are first, being patient while doing it and second, thinning your paint. Trying to rush this process can mess up your previous layer. Then you're in a bind because you can't just go back and cover it up with a base color. You've create lots of surface variations and you'll never get it duplicated exactly. Take your time. Getting your paint thinned to the consistency that works best for you can require some experimenting. Would it surprise you if I told you different brands of paint thin in different ways? Not that I need to make this any more difficult. The flip side is you don't have to be perfect with your thinning for the process to still work. Get it close enough and you can go from there. 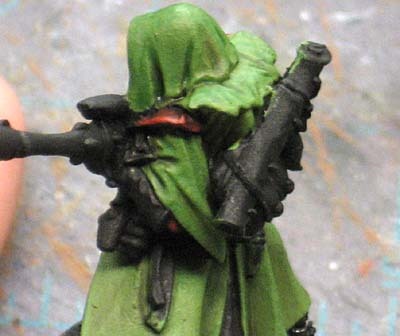 Layering is one of those things that can add a good amount to a model and it's something you can use to create focus on certain points on a model. It's a bit more than slapping a wash on, but then again the results are a bit better too. I have found myself doing this more and more. Thanks for the info Ron! Nice tute/article. Thanks for posting! I really dig P3 paints for thinning. Since they use a liquid pigment, you can thin the HELL out of them before you get any separation. Glad to know it's helped a bit. Longscope: I have a few P3 paints and they do seem to do well with thinning. Almost to the point of creating a glaze with them and getting a very subtle shift in color. Layering has always been hit and miss for me. Sometimes it comes out just as I wanted, sometimes I can't get it to be anywhere close to what I wanted. I have some P3 paints on order and if their even easier to thin and use then Citadel paints I may have to make a change. Reaper was another good paint set for me. Unfortunately my FLGS stopped supplying them and now I have to order online. Not only different brands take different ratios of water to thin properly, but sometimes it is even different colors from the same brand! Then we get into the whole matte mediums and water ratios and alchemy, and stealing paint recipe grimoires from gnomes. The arcane concept known as consistency of milk remains a mystery to some... Patience! Kevin: The more you do it, the better you'll get at getting your paints thinned just right and getting a feel for what is going to work best. Klumsee: There's way more to it, you are correct. The idea of "milk" is more like a staerting point for those who've never done it before. Experimenting is best in this case and even more important is patience like you said. Just a dab in about a pallette divot full of paint makes a big difference! Thanks for sharing this. This is a really nice tutorial. Dain: I haven't gotten into any kind of paint extenders just yet. I suspect one day though. I was wondering about layering on flesh. when I try to do it I find myself not knowing where to put the final highlight on the muscles. No matter how I do it, it always looks wierd. Nathan: You can take a zenithal type approach and consider where you're light source is coming from. I've found that best for defining the overall shape of the body part. Some folks will use short strokes to add a bit of texture (similar to muscles) when they highlight in places where it's appropriate... like arms and such. In terms of a final highlight though, I often use very tiny dots of white or the lightest color in that last spot you've worked up to.